You’re an experienced facilitator, but The Five Behaviors of a Cohesive Team™ program is different. Sessions can get intense. Participants can become emotionally expressive. The team leader can be defensive. Timelines and scripts can get thrown out the window. As a facilitator, you can influence whether a team sees an uncomfortable moment through or misses out on the opportunity to grow. 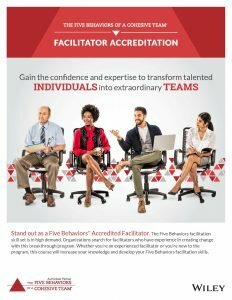 Facilitator Accreditation will help you hone your instincts for when to stick to the agenda and when to improvise, when to let a debate play out and when to cut it short. The Five Behaviors Facilitator Accreditation is the best resource for building foundational knowledge and tools for facilitating this powerful team development solution. More than 7 days prior to the start of the course, registration can be canceled with a full refund. Between 1-7 days prior to the start of the course, substitutes are allowed. If the registrant does not have a substitute and we can fill the spot with someone on the waiting list, the registrant is liable for a $100 USD administrative fee. If the registrant does not have a substitute available and we do not have anyone on the waiting list, the registrant is liable for $1,000 USD for the cancellation. Less than 1 day prior to the start of course, if the registrant does not have a substitute and we do not have anyone on the waiting list, the registrant is liable for the entire Accreditation cost ($1500 USD Wholesale). No participant substitutions allowed after the start of the course. We reserve the right to cancel this course at any time and offer a full refund. If an organization has registered Five (5) or more people for the same course, they will be eligible for the group discounted rate for each person in attendance. If one or more registrant cancels their registration, the registrant will be billed at the full course cost if they no longer meet the minimum requirements for volume discounts.